Al Hartmann | The Salt Lake Tribune Robert McDaniel has been named Murray School District's new assistant superintendent. 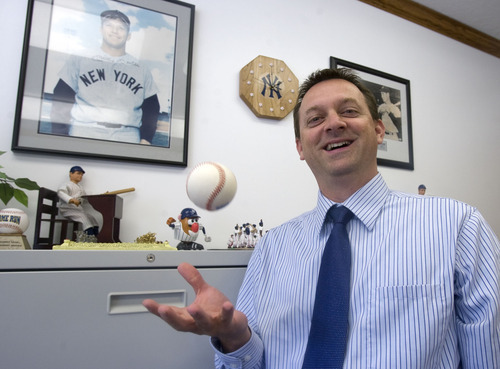 He is a serious Yankee baseball fan, tossing a 1999 World Series ball in his office. Ask Robert McDaniel to describe himself, and he'll tell you he has an "extreme personality." The newly appointed assistant superintendent of Murray School District isn't ho hum about much in life. He's a diehard New York Yankees fan. He loves comedy and editing his own films (most of which document the lives of his three daughters). And he's passionate about reforming struggling schools and programs. As Kearns High School's debate coach, he grew the debate program from 35 students to 180 by his second year at the helm, and a year later guided his debaters to the first of three straight state championships from 1995 to 1997. "It was satisfying because when I first got to Kearns, what kids were told was 'We can't compete against the Skylines and Binghams,'" said McDaniel, 43, who was promoted to his new position at Murray district July 1. He had been director of personnel and student services in the district since 2006. McDaniel did his best to change the culture of Kearns' debate. The former deejay who dreamed of becoming a comedian, stood on pianos, advertising the program using "crazy shock value." Once students were in, he built them up. After debate competitions, McDaniel had students tack their best ballots to his classroom walls. When they got better scores, they replaced their previous best ballots. "I was visually showing them they could be successful," said McDaniel, who was raised by a single mother in Magna and graduated from Cyprus High School. In his second year as debate coach at Kearns High, the school took fifth in state. Then came the three-peat. After that, McDaniel, who also coached soccer and baseball at Kearns, left teaching for administration. As principal of Granite Park Middle School (now Granite Park Junior High), McDaniel led the South Salt Lake school to huge test-score gains. "I had seen six other principals go through there, and that was the first time I've seen what I understand true leadership to be," said Bill Berneau who worked as a teacher under McDaniel at Granite Park and participated in the turnaround. "He had a vision." Berneau, who now works at Hillcrest Junior High as an assistant principal, said teachers' attitudes changed immediately with McDaniel in charge. He "began to lift up those underneath him to become leaders," he said. "We had never seen such change and such a growth. He walked through the halls with the vision of what we could become." Berneau said McDaniel has "a charisma I've not seen in other people." Now in his 19th year in education, McDaniel is second-in-command at Murray district, working under newly appointed superintendent Steven Hirase, who replaced retired Richard Tranter at the beginning of the school year. "He has the kind of personality that engages other faculty members and students," Hirase said. "He understands what it takes to make changes in schools, and he's got great leadership skills." McDaniel in the past always worked at at-risk schools. His job at Murray district poses new challenges. McDaniel said the district isn't in need of a "complete overhaul" like Granite Park, but could use some "fine tuning." "I think in Murray we get pretty good test scores, and we'd get pretty good test scores no matter what we did because we have a good population, good families," McDaniel said. "I think we have to kind of take a look at ourselves and figure out what we can do to instead of being pretty good, what can we do to be great?" A tireless reformer, McDaniel is also a jokester who performs convincing impressions (ask him to do Casey Kasem or Dana Carvey's Ross Perot). District receptionist Sharon Knapp said McDaniel sometimes will leave small toys in staffers' mailboxes. "He likes to surprise people. They'll say, 'What is this?' and I'll say 'Rob is leaving you a gift,'" Knapp said. "He's very intelligent, and he's excellent in his work, but he likes to make people laugh." D. Wright, Murray district's spokeswoman, has seen McDaniel's goofy side firsthand. "Every picture I've ever taken of the office staff, I can never get him not to pull a face," she said. "It drives me crazy." McDaniel said it's all about lightening things up, putting smiles on people's faces, even in stressful situations. "I'll try to change the mood in the office or other places," McDaniel said. "All of a sudden I'll be in front of the counter, and I'll say 'Who put these steps here?' and I'll walk down the steps, or I'll crash into someone's cubicle just to give them a jump, or pull a little joke on someone." His prior human resources job with the district had a more serious tone. McDaniel says he was seen by some as "the bad guy," because he was involved with not only hirings but firings, and was the district staffer who got involved when there was a problem with a teacher. He also currently serves as chairman of Utah Professional Practices Advisory Commission (UPPAC). "That's about the most serious teacher organization there is," he said, "because if any teacher gets in trouble, if any teacher gets arrested, UPPAC determines if you can keep your license." He hopes to get the same results at Murray he has achieved elsewhere.